Romney Shipway // SHIPWAY Living Design — Bench & Co. I met Romney at IDS last year. A colleague of mine attended Emily Carr University of Art & Design with him and had wonderful things to say about his work and eco-friendly vision. His display included playful colours and fresh aesthetics that I could easily envision in both residential and commercial spaces. Curious to learn more about his process and what he’d been up to over the past year, I visited his studio for a chat. What’s on your bench today? These are my Ostra stools. They’re part of a larger collection that includes a coffee table, a credenza, two stools and, most recently, a bench. How did you come up with the design for the Ostra collection? During a trip to Cortes Island, where I grew up, I started looking at oyster shells. The outside is really rough. Then you open it up and it’s pearly white and shiny. I decided that I wanted to bring those same characteristics into a coffee table. What problems are you constantly working towards solving as a designer? For me, it’s always about sustainability. All of the finishes and adhesives I use are water-based and VOC-free and all of my materials come from regional, sustainable sources. Sustainability also means efficiency. A lower amount of time spent on something is a lower amount of carbon. If it takes too long to do something, things like electricity and even human hours are being burned and wasted. The less time it takes to do something, the less energy is being used. Time is always one of my driving constraints so I’m constantly questioning how I can refine my process. How did you apply sustainability and efficiency to the Ostra collection? The biggest accomplishment as far as sustainability and efficiency with the Ostra collection is the amount of wood used. Each stool is made from a single 8ft long 2x6. That’s it. Two 8ft long 2x6s will make one accent stool and one counter height stool perfectly. I’m constantly trying to make production more efficient. I’m figuring out what tasks take me the longest and what I’m doing that’s unnecessary. For example, this is the 2nd generation of the Ostra accent stool. It initially had a cross-rail like the counter height one. Then I thought, are those cross-rails really necessary? Because they’re lower to the ground, no one needs it to rest their feet on. So I made one without and tested its strength in the studio. And it worked. The result is less material, less time and overall less energy. When did sustainability begin to be a core value in your process? Growing up, it was always just a way of life. I was raised with that mentality. My family ate organic foods and used local products. Cortes Island was one of the first places in BC, maybe even in Canada, to have a recycling centre. I was five when that opened. They also had one of the first free stores. It was just sort of about living a life that’s sustainable. It’s ingrained in me. When did you start building furniture? My dad is a designer/builder. When I was growing up he was always working with wood. He doesn’t have any formal design training but he builds custom homes and even boats. I grew up in his shop and was always playing with his tools. I never really made the choice to work with wood, it just sort of happened. I’ve always loved it. It wasn’t really a thought; it was just what I was going to do. Do you remember what your first paid job was? When I was eight, I went to a local grocery store. They had these big gallon jars that they needed lids for. They paid me $5 a lid. I made them on a lathe out of scraps of maple that my dad had. I remember that they looked like little buttons. That was my first gig. I never did much furniture when I was young, just little things like that. When did you decide to go to design school? I had my own company building custom homes on Cortes Island. Then 2008 happened. Before that, I’d never had to try to find work – never advertised or made a call. I was working on a project that was wrapping up and I realized one day that I had nothing scheduled after it. I had been building six homes at once and I was pretty burnt out. My cell phone bill one month was 6,000 minutes. I did the math and realized that it was equivalent to being on the phone for eight hours a day, for two and a half weeks. I realized what I was doing wasn’t creative and wasn’t what I’d wanted to do. I’d always been interested in the Industrial Design program at Emily Carr, but I was busy and it was a four-year program. When 2008 happened, I applied. I figured if I got in, I’d go. By the 2nd year of the program, I started focusing on furniture. By the time I graduated, I already had a shop on Hastings Street, and was working on my first product lines. 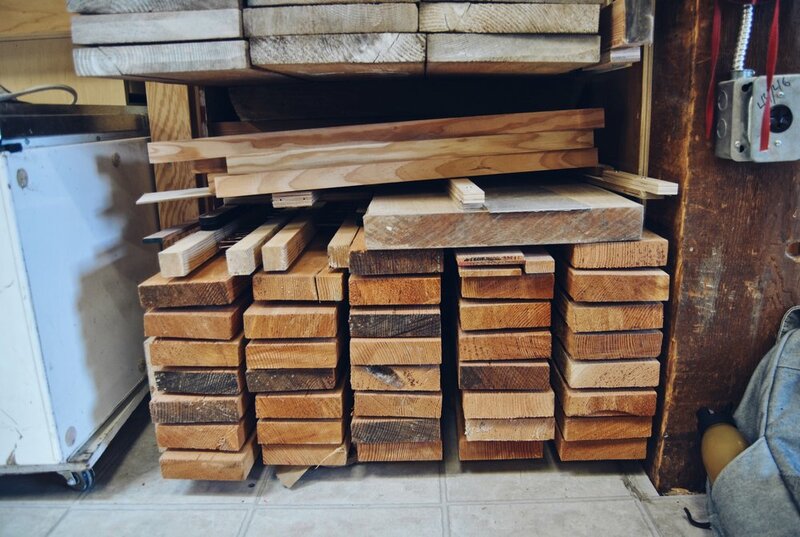 From growing up in a wood shop and running your own company building custom homes, I imagine you already knew a lot about how to make furniture. What did you learn at Emily Carr that you didn’t already know? Design. I already knew how to build things, work in a shop, and create aesthetically pleasing forms. What I didn’t know was the methodology of design and design thinking. I never realized how deep and complex it was. I learned how to approach a product or space. 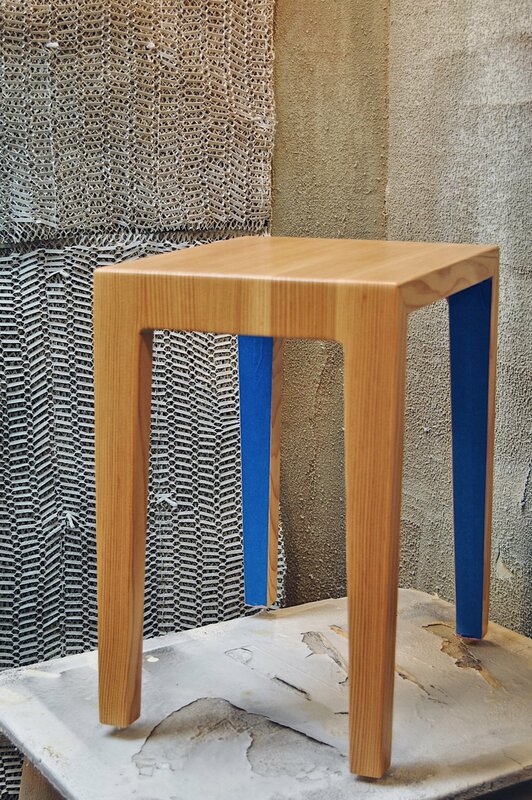 It’s not about setting out to design a “cool” looking stool, but if you follow the proper design process you will end up with a “cool” looking stool that is honest to its form and function. How important are the materials that you use and where do you source them? Materials are the launching point for embedding a story into a piece. All of the materials I use come directly from the island or from low-carbon resources. It makes a great conversation starter. The wood I get from Cortes Island is through the Community Forest. It was started as the Cortes Eco Forestry Society 20 years ago by my dad and some other people on the island. Up until then, all of the logging was being done by multi-national companies that only cared about their own bottom line. A lot of the locals weren’t happy with the bare-minimum standards the loggers were following and the effects that logging had on the island. Eventually the corporations stopped coming to log because they didn’t want to deal with protesters or slashed tires. The government wanted the land to be logged because they get a percentage of the profit. This was leverage for the community to approach the government and propose local logging. The Cortes Eco Forestry Society partnered with the First Nations group on the island and created the Cortes Community Forestry. The group is responsible for all forestry on the island and has a commitment to log a certain number of trees each year. This community decides which trees get logged, who does the work, etc. Everyone doing the work is from the island. It’s pretty revolutionary as far as the forestry industry – it’s the first of its kind in Canada. Was there a time when you started going down a road with a particular material only to find that it wasn’t quite right? I’m always experimenting with new materials. I’ve gone back and forth on the idea of using concrete because of the carbon footprint, but I met a guy in Langley that gets leftover concrete from the construction industry. I made some molds and he would pour things for me. It was carbon neutral in a sense because it was already poured. At one point, I decided to make a coffee table with wood and concrete. First, I had to make the piece that I wanted in concrete out of wood. Then I had to make a mold. After that, I filled it with white plaster so I could fine-tune the mold. It has to be perfectly straight for the wood top to be aligned. It turned into problem after problem. Two years to the day since I started trying to make it, I decided it was just too much of a battle. I was forcing it. I revisited my design thinking: sustainability, lightweight, less carbon. It was then that I realized, why am I even using concrete? My biggest challenge at the moment is trying to come up with one more piece for IDS Vancouver. I want to do a light fixture but I don’t know what it is yet. I’ve been working on a continuous piece of wood with an LED strip in it. I want to get it so that all the light is facing down, but I can’t seem to get it figured out yet. I’ve gone through several prototypes. I have a whole box of things like this – I call it my experiment box. I’ve got a few pieces in here that are made out of soy resin. I was thinking that a light made out of soy resin could be interesting. There’s also a chair that I’m still trying to figure out. I’m working towards making it from a poured mold. Is there anything in particular that we can be looking forward to seeing at IDS West? You’ll get to see the new Ostra bench. That’ll be the last piece of that collection. I’m working on some new colours, but the components are all there. I also have a new line of wood and Carrera marble tables that I’ll be launching at IDS West. Marble is something we haven’t seen from you before. How does that fit into your design thinking? I was on the hunt for another material to compliment wood. I was working with this marble company for a kitchen project and saw this bin of small scrap pieces in their shop. I asked about it. They said the bin gets put out back and if nobody takes it, they crush the marble. They simply can’t use any pieces under three feet. So much carbon has already gone into mining, slicing, and transporting this marble. They use about 60% of it and the other 40% gets crushed and used on the road. I saw this as an opportunity to reclaim a beautiful material. So now, they give me this scrap material for free and I pay them to cut it to the sizes I need. What’s in the future for SHIPWAY Living Design? I’d like to design a house. My original plan was a Masters of Architecture degree after Emily Carr. I’ve been fortunate enough to work with some fantastic architects on renovation projects. Now I realize that, with the right team, I can design an entire home and continue to be hands-on with the construction process. I’d also like to do more lighting. Ideally, I’d like to make an off-the-shelf-light; something the consumer can buy, plug in and use rather than something that has to be designed for a specific space and installed. Has the business side of things been more challenging as a furniture company in Vancouver than it was as a home builder on Cortes Island? Yes, definitely. Working on Cortes Island was like the Wild West. I never had a business license. There weren’t any building codes. If I wanted to put a driftwood pole in the foyer as a feature, it was no problem. If I want to do that here, I have to hire engineers and get permits. All of a sudden a piece of driftwood is a $5,000 expense that takes months to coordinate. 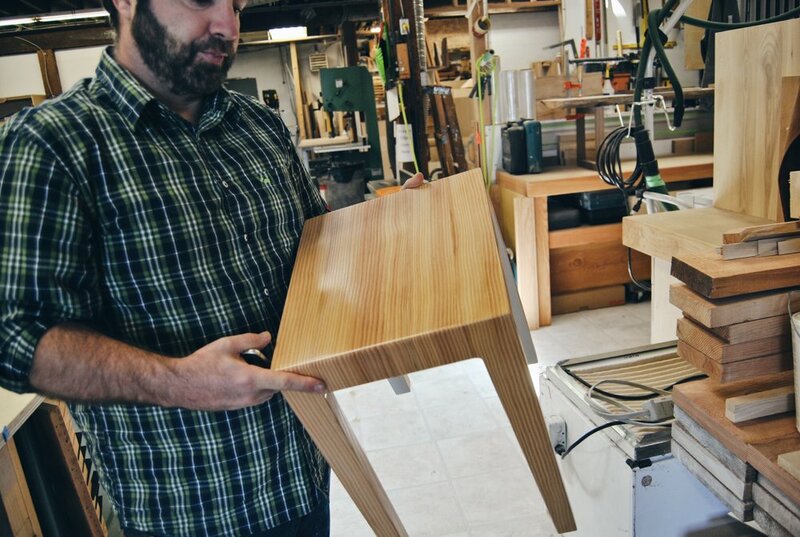 What tips would you give to other furniture makers just starting out? Find a good accountant. Interview that person more than anyone else. Building out that relationship is valuable but also a huge investment. Get your PST and GST number. I didn’t know that you needed a PST number. If you’re selling a finished product, you have to charge PST to the consumer but you don’t have to charge it to stores. Always set up accounts. Trade discounts add up fast. Figure out what your thing or things are. What are your objectives? Why are you doing what you’re doing? If they’re true and that’s really what you believe in, they’ll always save you when you’re lost. To learn more about SHIPWAY Living Design, or to get in touch with Romney, head to shipway.ca.